Persil bio helps remove tough stains, even in a quick wash. Works well on greasy and oily stains. Long lasting fresh fragrance. Formulated with wash booster technology to remove stains like mud & grass. Biological washing powder containing enzymes for effective stain removal. Persil bio detergent is also available in liquid, capsule, or tablet format. For fast, effective stain removal, Persil Bio Washing Powder is the perfect choice. This bio washing powder with wash booster technology removes tough stains, even in a quick wash. Persil biological washing powder contains enzymes that break down stains and help lift them from fabrics. These enzymes in biological detergents work efficiently at lower temperatures, which means you can achieve great stain removal with Persil bio, even in a cool wash. Its wash booster technology is brilliant for removing a great variety of common stains, including mud, grass, and grease stains. With an effective formula for stain removal and a long-lasting fragrance, Persil biological washing powder is a great detergent to have in your cupboard, especially if you've got kids around - the worst culprits for picking up stains! How to use: Follow these instructions for optimum results when using Persil washing powder. Sprinkle some washing powder into the dispenser drawer (see pack for full dosing instructions) and check the care labels on your garments before selecting the appropriate wash cycle and temperature. This washing powder can be used for both machine washing and handwashing. If washing clothes by hand, follow the instructions on the pack and dissolve the washing powder completely in water. Always test the colourfastness of any new coloured clothes before laundering, and wash light, dark, and coloured clothing separately to avoid fading or colour run. 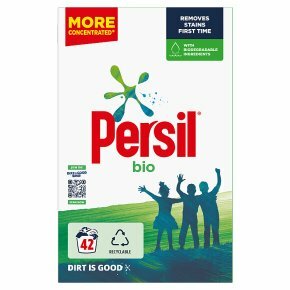 Persil Bio Washing Powder is not suitable for silk or wool clothing and you should not use a paste of Persil washing powder and water to treat stains. Warning: causes serious eye irritation<br>Keep out of reach of children. If in eyes: Rinse cautiously with water for several minutes. Remove contact lenses, if present and easy to do. Continue Rinsing. If eye irritation persists: Get Medical Advice/attention<br>As we are always looking to improve our products, our formulations change from time to time, so please always check the product packaging before use.